Twitter users have forced the owners of the popular website to change direction. The users have effectively hijacked the site and led to a visible change in what Twitter is about. 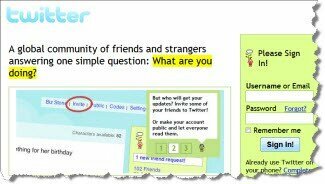 When Twitter was launched it asked “What are you doing?”. But the front page now says “Share and discover what’s happening right now, anywhere in the world”. Twitter has moved from people saying “I’ve just had a cup of tea” to people breaking major news stories, recommending links and even selling stuff. In fact, no-one can really see the point any more of saying what they are doing right now. That, of course, is good. The fact that the users of Twitter took the site in a different direction is probably why it has been so successful. After all, we were hardly likely to go in our millions to find out whether or not our friends had just visited the bathroom. But sharing news, information, tips, ideas, knowledge – that does become much more interesting, which is why the hijacking of Twitter has been good. But for anyone involved with an online business, this has been a retrograde step. One of the problems with running an online business is that your customers can come in through your front door 24 hours a day. But if your offices are closed, they can’t phone you or get in touch easily if you are asleep when they are awake – and that makes them feel negative towards you. You could, of course, offer a 24/7 telephone service, yet that is costly. With the “old Twitter” you could easily keep people up-to-date with your staff’s current status. Indeed, if you are running an owner-managed business or you are self employed, this was a real boon. It meant that your customers and potential clients knew you were in the office, so could be contacted, or they knew you were out, which meant they didn’t waste their phone call. With the “new Twitter” your status updates get lost amongst the other material. And that’s a problem because it means your customers will find it more difficult to get in touch with you. Knowing you are “open” or that you are at the end of the phone is essential for your customers. After all, how often do you get frustrated knowing that your bank opens at 9am every day, to find you pop into town one morning, only to discover that day they open at 9.30am because they are “staff training”. I went to PC World last year on a Saturday, only to find they were closed for stock-taking..! If we know when a business is “available” we don’t get frustrated with that business – and it’s the same for your potential customers. If they know when they can contact you, because they can see your status, you improve your chances of contact and people think more positively about you. This issue was raised by Andrew Sansom, a freelance photographer who asked me if a web site should show the owner’s status – and how. Well, yes, you should certainly show your current availability on your web site. Highlighting your 24/7 phone service would help, but if you can’t be available 24 hours a day, highlight your current availability – as I am now doing on the top right of this page. How can you do it? Firstly, set up a second Twitter account, which is “private” by selecting the “Protect my Tweets” option in the Settings:Account page. Then use a Twitter widget (from the same page) to publish that account on your web site. If you use WordPress or something like Joomla, you will find various extensions to also allow you to do this. Then, whenever you change your availability, you simply send a Tweet on that account – most easily done using a SMS text message, to avoid having to log out of your main Twitter page. Your web site will then be automatically updated showing your current availability and status. And if you use some of your keywords in your Tweet, you’ll also be helping your web site a little bit. More importantly, though, your customers will know whether or not they can get hold of you – which could make all the difference in their attitude towards your business.